This is the famous view of the botanic gardens in Madeira which we were lucky enough to visit a few years ago. The colours are all produced using succulents. A photo like mine seems to be in all holiday brochures. A Bristol coach firm used to run a winter trip to Kew Gardens in London. Unsurprisingly the orchid house at Kew quickly became one of my favourite places to visit when the evenings became darker. For a short while we could forget the British winter and imagine we were walking through the tropics. So I thought I would share a few photos and memories from a winter trip Bill and I made to Madeira a few years ago in case any of my readers were also feeling the onset of winter blues. This photo was taken in winter when my own garden at home was looking very bare. Most guidebooks claim that the island of Madeira which lies in the Atlantic off the coast of North Africa was discovered by the Portuguese in the 15th century. However there is some evidence that the Romans knew of its existence. What does seem to be true is that when the first Portuguese sailors landed there it was uninhabited. Unlike the Canary islands which belong to Spain, Madeira is still part of Portugal. Madeira is one of the few places in Europe where sugar cane can be cultivated. Luckily for the early settlers sugar was much in demand and plantation owners became very rich. One of the early sugar traders was Christopher Columbus who lived on Porto Santo a small island off Madeira and married a local girl before discovering America. These days a replica of one of his ships is used to take people on trips round the bay. Aloe flowers. This is the same family as the Aloe Vera used in sun cream. Being a volcanic island Madeira has no native plants or animals. Everything has been imported by sailors or carried by the sea or the wind. When they first arrived the Portuguese found a wooded island. Fortunately they had experience coping with the dry Atlantic climate. Cloud usually covers the top of the extinct volcano. The first settlers dug ditches called Levadas to collect the moisture from these clouds and so irrigate their fields. Remarkably, some of these date back 500 years and are still in use. Now they are popular with hikers who want to climb into the mountain. The soil is extremely fertile and there are few natural pests. The Portuguese King, Henry the navigator encouraged settlers and the island soon became an important refuelling stop for sailors attempting to reach South America or the West Indies. Sailors returning from transatlantic voyages often brought back seeds and exotic animals and birds. One eccentric landowner even gave tickets to one of his balls to any one bringing back a new plant. Madeira is now nicknamed the garden island and here are two gardens I would recommend visiting. Both gardens are situated on the side of a steep hill so visitors need a reasonable level of fitness. If you like plants a visit to the botanic gardens is a must. It is a little old fashioned . As well as local plants they have a large collection of plants from Africa and South America. The gardens also have a collection of parrots. The first time we visited it was also home to Madeira’s oldest inhabitant, a giant tortoise, reputed to be 140 years old. The botanic gardens are in the village of Monte high above the capital Funchal. You can reach it by bus or cable car. Fit local men push the braver tourists back down the hill in toboggans. We rode in the cable car up to the Botanic garden and enjoyed spectacular views over Funchal. 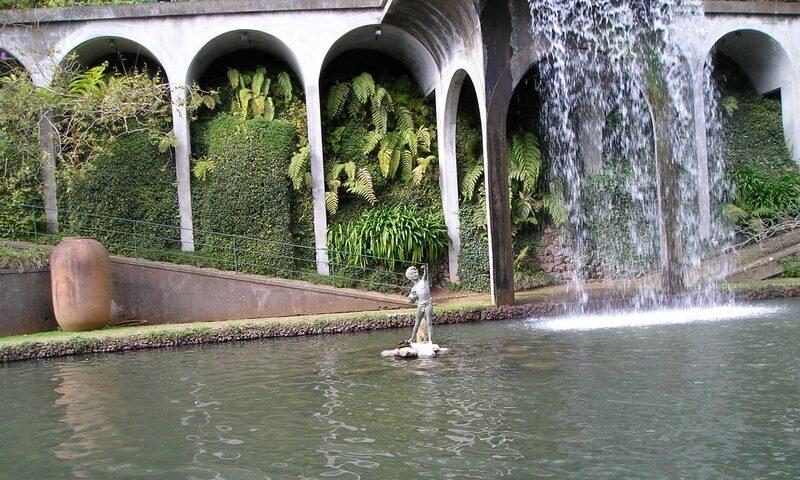 Another interesting garden close by is the tropical palace garden which has displays about the history of Madeira. It also has a large collection of decorated tiles and a gallery with displays of Zimbabwean sculpture and rocks and crystals from around the world. Nowadays Madeira is a popular cruise destination. If you have visited the island or enjoyed this post I would love to hear your thoughts or tips. I haven’t been here but the gardens are beautiful and the location stunning. I’m not sure how I’d feel about the toboggan ride down though. I think it is more comfortable now they have replaced the cobbles with tarmac on the roads but we opted for the cable car. We went to Madeira a few years ago but I didn’t know about the things you’ve written sirab here. Really interesting post! Oh I so want to visit Madeira! I have heard it is a beautiful place to visit! My friend has a holiday villa in Madeira (I’m waiting for an invite to visit!) I literally drool over her photos – I have a degree in botany/zoology and I think I’d get to see lots of lovely things there! I think you have picked the right friend. We thought it was beautiful. What a beautiful place to visit, I’ll have to add it to my (ever growing!) bucket list! Those gardens are so lovely! Oh wow, so much beauty nature to explore here – love the pics and descriptions – feels like I was there myself! This is stunning, my parents always said they would love to visit here and now I know why! What a beautiful place. I am loving the history here. I just love that first photo; those garden designs are amazing!! Pinned. I’m dropping in from Something Old, Something New. I homeschool my children, and I love geography. We’re covering Europe right now, but I think we’ll take a trip to Madeira (in our studies, not in person of course). It’s easy to see why it was desirable for colonization. I didn’t know that succulents and aloe were indigenous there. It was also the last fueling stop for boats going to South America.